This blog is a mess! I have a couple of new recipes in my draft folder but cannot seem to find the time to publish them. Over the weekend I posted pictures of them on facebook and instagram and asked everyone which to post first. It was a pretty close race, but I promise those white chocolate lemon tartelettes you were crazy about are going to be next! I don’t claim that I know a lot about chili. Heck, I can’t even get proper chili powder over here. And for this recipe, I used some ingredients you would probably not put in a chili. So maybe this just a stew and not a chili? Well, you decide! When we were in Malta I picked up a couple bags of rare (in Germany) looking beans. I got some dried fava (broad) beans and some black beans. 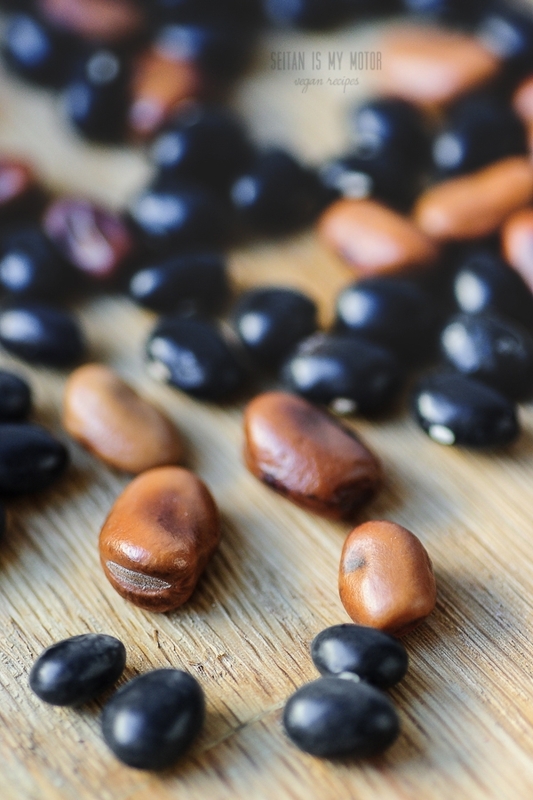 The black beans were produced in Madagascar and were double the size of a black turtle bean. The fava beans were even bigger. I bought both because I wanted to make my own version of the Maltese bean spread bigilla. I just hadn’t looked up what bean to use. Later I found out that bigilla is made with fava beans, but I never got around to make it. So those beans were lying in my pantry right next to some soy curls that were a gift from the generous Panda with Cookie. This weekend I finally brought myself to pull these items out of their corner. It had gotten cold again, there was a tiny bit of snow and so it was the perfect occasion for a warm chili. Typical chili spices are ground chili peppers, oregano, cumin and when I collected them from the spice rack I spotted my jar of star anise fruits. Star anise is often used in Chinese or Vietamese cooking and it’s one of the components in five spice powder. The Indian spice blend garam masala may contain star anise as well and you can find it in chai. For me it is associated with Christmas baking, as I put it into my lebkuchen spice mix. I like star anise a lot for its liquorice flavour and its beautiful shape. It is often used in meaty dishes, admitted these are Asian recipes. Since I was planning on a meaty chili by adding some soy curls, I thought I should try and throw in a star anise as well. It was a very good idea. 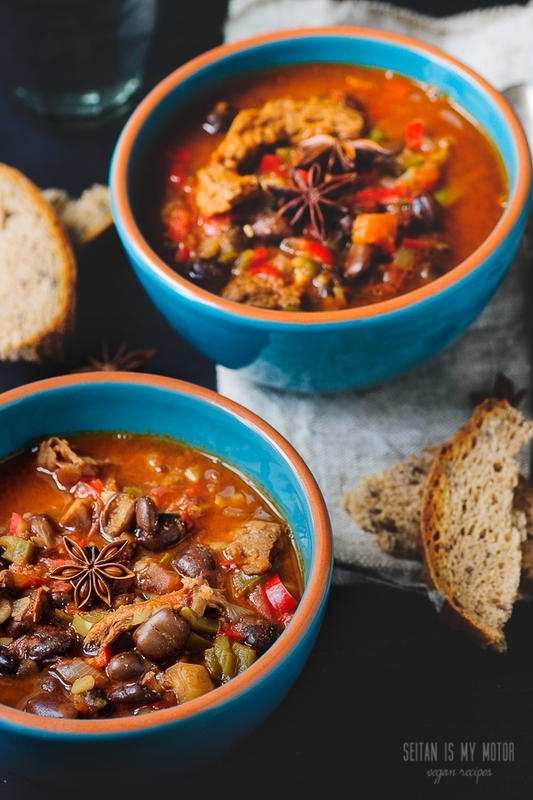 Cooked for 30 minutes and then removed, the anise fruit added only a very subtle liquorice flavour that made this stew stand out from other chili recipes. Place the soy curls in a bowl and top with hot vegetable broth. Let sit for about an hour. Heat oil in a large pot and add onion, garlic and peppers. Fry over medium heat for 5 minutes. Deglaze with wine. Drain the soy curls and squeeze out as much liquid as possible. Reserve the liquid and place in a measuring cup. Add water and fill up the measuring cup to 600 ml (2 1/2 cups). Pour the liquid into the pot. Add drained soy curls, tomatoes, beans, and spices. Bring to a boil and cook covered for 10 minutes. If desired, remove a serving for a child or someone else who doesn’t like spicy food now. Add the chili pepper and the chipotle to the pot. Cook for another 20 minutes. Remove star anise and bay leaf and serve with bread. 1. Dried fava beans have a tough skin that is commonly removed after cooking. But don’t do it! 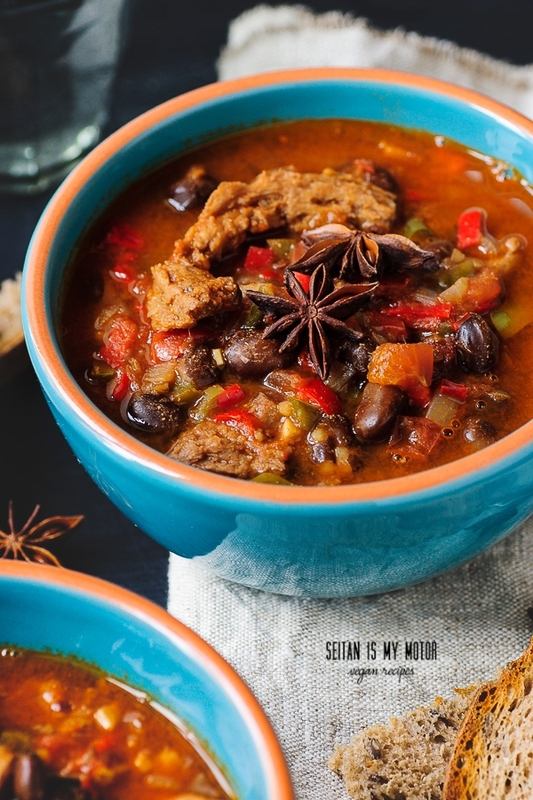 The skin adds both flavour and texture to the chili that you don’t want to miss. Alternatively you can use canned favas, they come with a softer skin. 2. We have a toddler in our household who doesn’t tolerate heat. Therefore I removed her serving before adding the green chili and the chipotle. You can add them earlier, if heat is not a concern.